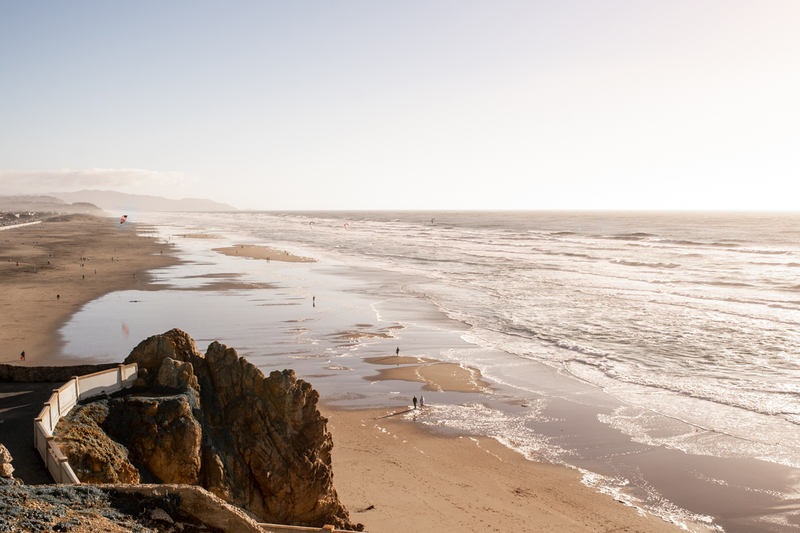 While much of the country was blanketed in snow this weekend, we were reminded of the perks of California living. It was warm enough to ride with the top down and take a walk along the beach. We often forget how close the beach is to our house (20 minutes!) and vowed to take advantage of it more often this year. 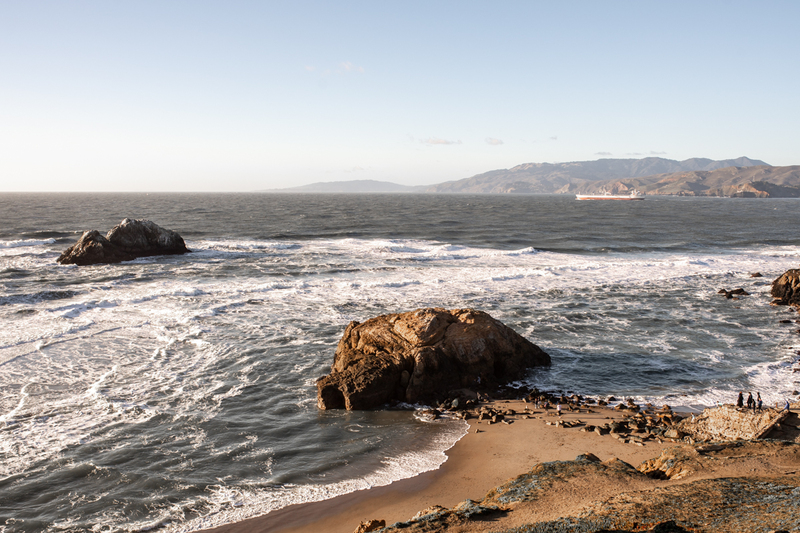 There are miles of coastal walking paths that run north along Ocean Beach to Sutro Baths in Lands End Park and onward to the Golden Gate Bridge. We love taking a walk at sunset and stopping for a drink right as the sun starts to dip below the horizon. 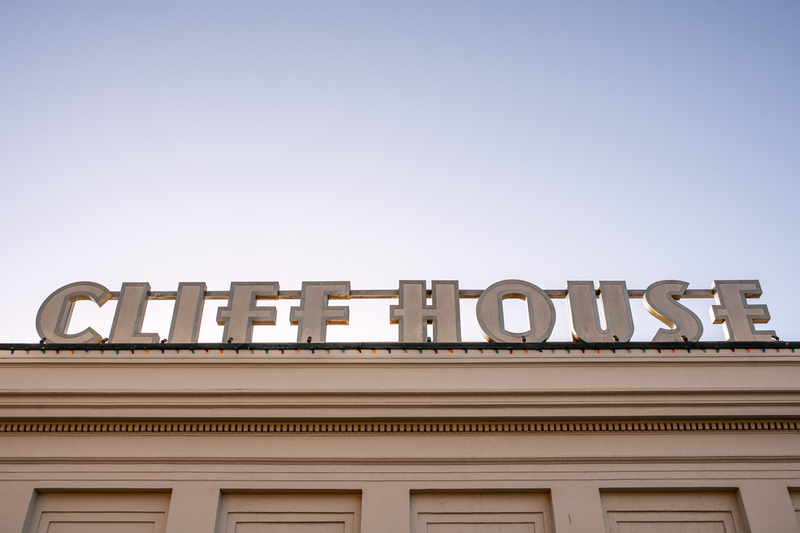 My favorite watering hole is undoubtedly the Cliff House, a 1909 Neoclassical icon perched on the cliffs overlooking the Pacific. The property is a part of the National Parks Service, and has been restored to evoke the glamour of a bygone era. We were lucky to grab two seats at the bistro bar near the windows, right as the sun began to set. 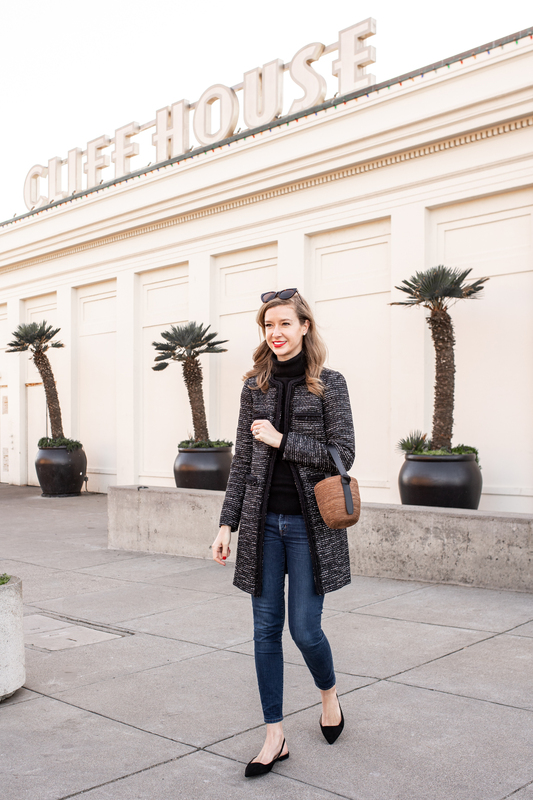 I have been wearing this tweed coat all weekend and love the polish it lends to a simple sweater and jeans outfit. J.Crew has released a version of this coat every year for the last few years, and I especially like this year’s edition with its black and white tweed body and the tiniest metallic threads woven throughout. The coat fits true to size and looks best worn open, though there are tiny eyelet closures down the front as well. The tweed’s nubby texture keeps the silhouette from looking too formal, and pairs equally well with jeans, a straw bag, and flats, or dressed up with tailored cigarette pants and heels. 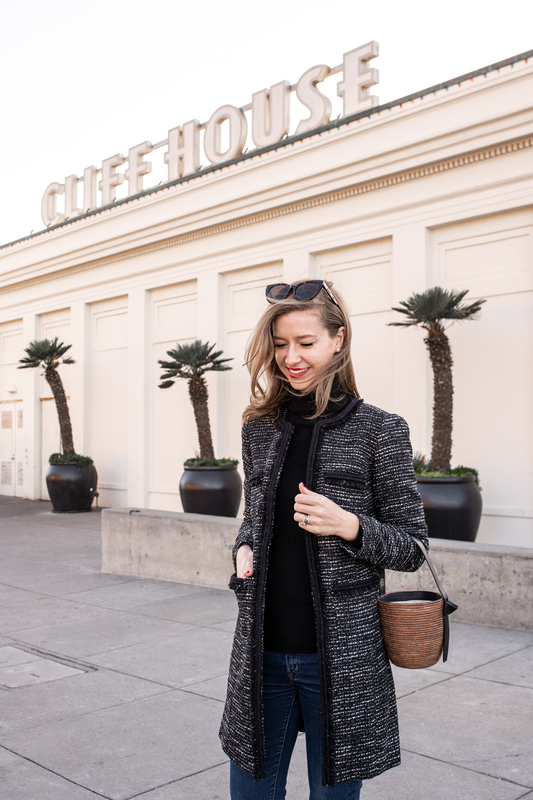 If you’ve been looking for a timeless, ladylike coat, this one is such a steal right now for $56 with code “GOFORIT” (originally $248) and is exceptionally well made – especially for the price. I’m increasingly drawn to bags that don’t have any hardware on them since they are so much more versatile when you don’t have to match silver to silver or gold to gold. This straw handbag by new-to-me brand Cesta Collective is elevated by the beautiful leather handle and doesn’t feel overly summery due to it’s darker straw. Cesta Collective’s pieces are handwoven by female artisans in Rwanda using locally sourced renewable resources. I’m always so happy to discover and support a new socially responsible brand that is creating beautiful designs and putting their people first. My bag is currently on sale at Net-a-Porter, and I think this summer I’ll need to add this one to my collection as well.